One of my favourite things about working in Soho is that I’m spoilt for choice when it comes to great places to eat, granted there’s a fair share of naff places too, but on the most part its a gold mine. My problem is that walking the same streets every day, its so easy to become blinkered and walk past places or not notice the gems that, at a glance, look like any other humble non-descript cafe and I can get into the habit of just frequenting the same old places. So when I met a friend for a New Year’s catch up earlier in the week I wanted to find something new. I reached out to the food blogging world on twitter and the resounding response was Bone Daddies. I was advised to get there early as being yet another place with a no booking policy the queues build up quickly. I shot round there as soon as I left the office and we were seated straight away, we were even offered a choice of where we’d like to take a pew, however not long after we arrived the place was full and the queues were forming by about 6:15. With stools and benches reminiscent of my school science lab, Fleetwood Mac blasting out of the sound system and very trendy staff, Bone Daddies is undeniably a cool place to eat. The service was prompt and friendly and our menus were handed to us casually on a clipboard. Deciding to embrace the Japanese theme of the evening we ordered sake, which I’d never had before. I’m sure this is lovely if it’s your sort of thing however I can decidedly say I’ve tried it but I really don’t like it. I’m a fruity cocktails kind of girl when it comes to drinking so what tasted to me like bad wine laced with vodka didn’t really go down well. Please don’t dismiss trying this on my analysis though its just the sort of thing that’s lost on my palette. I might try one of their cocktails on my next visit. The food was a different story. 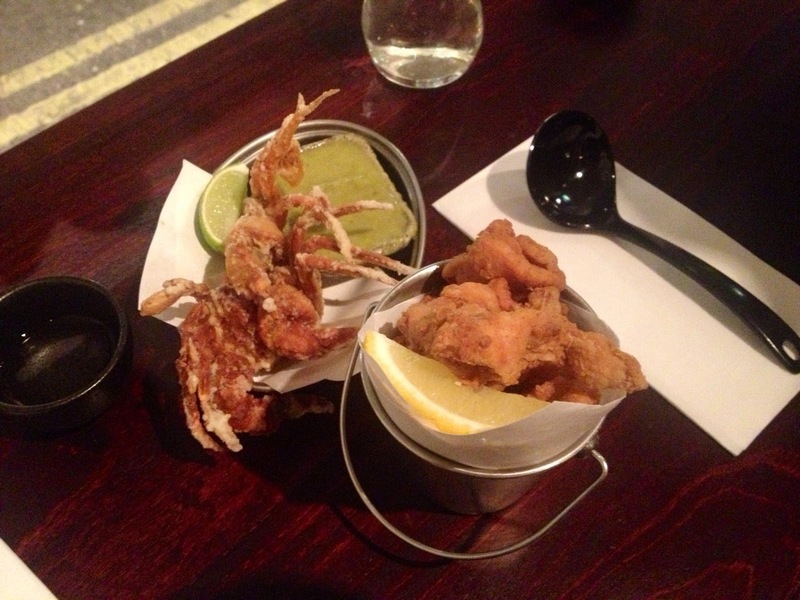 I’d read a few reviews so there were a couple of things I wanted to try from the snacks menu, we ordered the soft shell crab and the fried chicken. I’m not a squeamish person when it comes to food, I’m not the sort of person to go green at the thought of a fish being served up to me head and eyes still intact, and I have no qualms about getting my fingers stuck into a bowl full of mussels and pulling them out of their shells, but I have to admit the crab did weird me out a bit. Not enough to put me off my food mind you, I still tucked in and pulled its claws and legs off for dipping in the spicy sauce it was served up with. It was well worth the effort as it was tasty and meaty and the shell in particular was full of flavour. I’m glad I’ve ticked this one off my list. I really mustn’t let the novelty of the crab overshadow the fried chicken though… best fried chicken I’ve ever tasted. I don’t need to say much more about it, if you decide to pay Bone Daddies a visit, please order the fried chicken. Now for the main feature. 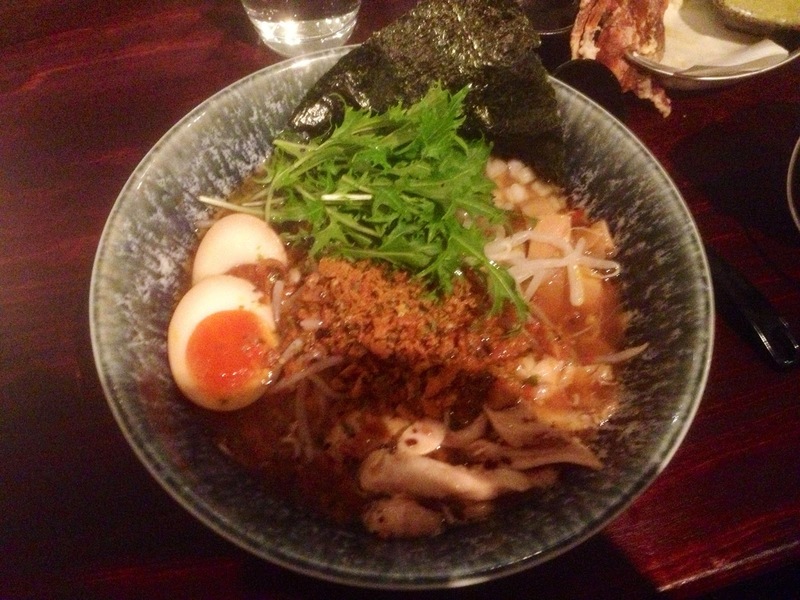 This is a ramen bar, and that’s precisely what’s on the menu. If you’ve never heard of it ramen is a Japanese based noodle dish where, put at it’s most simply, the noodles are served in a broth and the toppings, vegetables and meat vary from dish to dish. I know almost nothing about ramen so I just took a bit of a gamble and ordered the T22 as that seemed the most appealing to me at the time. This came with chicken and crispy fried chicken skin served crumbled on top. There’s also a list of extras that you can add to your dish at a really minimal cost. Now I’ve had ramen and I understand a little better what’s being served up to me, I think I’d order differently and go for something with a bit more heat and order extra noodles. I really enjoyed this dish though, it had a great warming comfort food feel about it. It’s also deceptively filling, I certainly didn’t manage to polish mine off. All in all I feel like I’ve learnt and achieved something from my visit to Bone Daddies, it was a pleasant exploration into a new cuisine for me and I loved that I got to try so many new things in one go, it’s a rare opportunity. It wouldn’t be my choice every time I wanted a reasonably priced dinner, I’d need to be in the right mood for Japanese, but definitely could do far worse if that’s what you’re after. I’ll definitely be going again and I’m looking forward to sampling the cocktail menu next time.